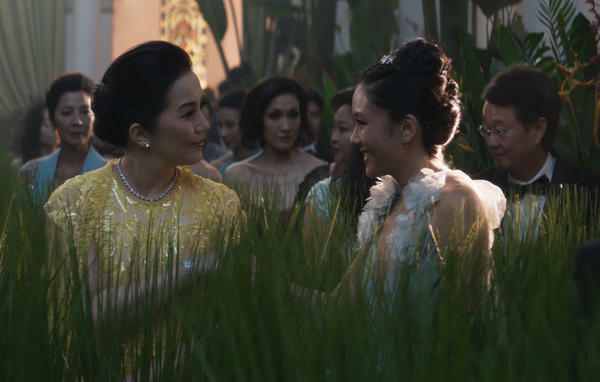 In the movie Crazy Rich Asians, Princess Intan (Kris Aquino, left) and economist Rachel Chu (Constance Wu) meet at a wedding in Singapore and have a little tete-a-tete about, of all things, microloans. Editor's Note: This story was originally published on Nov. 1, 2016, and has been updated. Crazy Rich Asians is, of course, not a movie about global development. But as it happens, the topic gets a cameo in the rom-com. Main character Rachel Chu (played by Constance Wu) is a professor of economics. And on a trip to Singapore to meet the family of her "crazy rich" boyfriend Nick, she goes to a big wedding and runs into a Malay princess, who has written an article about ... microloans. Rachel compliments her on the article. The princess says, actually, she was criticized for it. Rachel replies that the critics must have missed the point, because, according to Rachel, microloans help women — and women are drivers of the larger economy. So who's right? Are microloans a good way to lift people out of poverty — or not? Back in 2016, as part of a callout for story ideas, an NPR reader asked Goats and Soda a similar question: "I would like to know more about microloans, and if they are in fact helping women start businesses in the developing world." You've probably heard the stories. A desperately poor woman in a poor country gets a tiny loan — a couple hundred dollars. It's the break she's always needed. With that money she can finally buy the materials to start a small business. She turns a profit. Her income rises. Now she has money to expand her business even further, buy her kids more nutritious food, pay their school fees. Over time, she lifts her whole family out of poverty. That's the vision often associated with microloans in the popular imagination. But is it the reality? It's certainly possible that plenty of women have successfully used microloans for a small business purpose. But based on the economic studies that have been done to date, it doesn't appear that increasing access to microloans is an effective strategy for helping more women start businesses that will allow them to vault themselves out of poverty, at least not on a large enough scale to be detected. Still that doesn't mean microloans don't help poor people in all sorts of other ways. Until about 40 years ago, the world's poorest had virtually no access to credit from large-scale lenders. These types of lenders relied on traditional methods to determine if a customer could be trusted to repay a loan. And poor people were unlikely to meet those criteria. They often didn't own enough property or other forms of collateral to secure a loan. And they didn't have the kind of formal credit history, steady source of income or educational qualifications that could reassure banks in the absence of collateral. Moreover, even if a bank were inclined to make a loan to an ultra-poor person, the small size of the loan could mean the bank's earnings would easily be dwarfed by the administrative costs. So the world's poorest generally had to rely on loans from friends and family members, or, if available, from small-time neighborhood money-lenders who charge exorbitant interest rates. Then came the microfinance pioneers of the 1970s. Probably the most famous is Muhammad Yunus, an economics professor in Bangladesh who ultimately went on to found the Grameen Bank. But around the time Yunus was running his first pilot programs by lending his own money to women in Bangladesh, others were tinkering with similar approaches in, for instance, Central and South America. The models vary, but there's a common thread: the use of creative methods to reduce the cost of processing the loan and the risk of default. For instance, many lenders figured that by lending to a small group instead of individuals, they'd not only spread the risk but rely on social pressure from group members to ensure each borrower pays back their share. Other techniques include requiring repayment in frequent installments — for instance once a week — over a very short period, with delivery in person to the loan officer. As David Roodman details in his excellent book analyzing the case for microfinance — Due Diligence: An Impertinent Inquiry Into Microfinance — early on many microlenders also made a decision to focus and often even limit their services to women. This was partly due to the spread of feminism in the 1970s and '80s and the growing attention it brought to the particular difficulties poor women face in getting economic opportunities. According to Roodman, the emphasis on women also seemed to reflect a widespread view that women would be less likely to default — at least in part because, for better or worse, women would be more susceptible to group pressures to repay. The overall model has proved not just self-sustaining but profitable for lenders — prompting plenty of for-profit enterprises to jump into the game. Today it's hard to overstate how vast the microloan industry is: In 2015, an estimated 125 million people worldwide — about 80 percent of them women — were receiving a total of about $100 billion in microloans from the major microfinance institutions, according to MIX Market, a nonprofit that tracks them. The size of these loans varies widely, with an average low of about $200 in South Asia to nearly $3,000 in Eastern Europe and Central Asia. But the robustness and longevity of the industry speaks for itself: Across the globe, microloans are clearly serving a need. The key question: What is that need? Initially many in the microfinance industry seemed convinced the answer was, a need for capital with which a poor person can start a small business. In publicity materials and public statements, microlending groups have continually promoted the idea that that there are all sorts of entrepreneurial opportunities an impoverished woman could take advantage of if only she had the cash. The business plans have ranged from buying bamboo to weave stools for sale in a market to buying nail polish to provide home-based manicures. And so a sweeping assumption was quickly attached to microfinance in the public consciousness: If poor people — and again poor women in particular — could launch these small enterprises they could earn enough income to lift themselves out of poverty. At first the power of this vision seemed confirmed by a slew of reports from microlenders and other analysts touting the before- and after- stories of borrowers. There were tales of women who had been held back by crushing circumstances but finally broke free from poverty traps. So great was the excitement over microfinancing's promise that in 2006 Mohammad Yunus was awarded the Nobel Peace Prize. But a backlash was brewing. For one thing, news reports started surfacing of poor people who were selling off their last, meager assets to repay loans. Of course, these horror cases were just as anecdotal as the success stories. Far more devastating to the image of microfinance were a series of economic studies begun in the early 2000s. Dean Karlan, a professor of economics at Yale University who co-authored several of the studies, explains that all those rosy before-and-after stories were essentially meaningless. That's because they failed to prove whether a successful borrower had succeeded as a result of the microloan or for some unrelated reason. So Karlan and various others decided to design rigorous field experiments that would properly test the effectiveness of microloans. Karlan notes that at the time the entire notion of applying scientific methods to studying efforts to alleviate poverty was new. "When we started this work there had been practically zero studies using RCTs [randomized controlled trials] to answer a question on any development topic." Since then, about a dozen randomized controlled trials of microloan programs in multiple countries have been conducted — including six that were summarized in this paper in the American Economic Journal: Applied Economics and a seventh also included in this less technical roundup of studies. In each case they compared a randomly selected group of people who had been offered the loans to an otherwise identical group that had not. The studies looked at programs serving mostly women in countries that included India, Mexico, Mongolia and the Philippines. Across the board, the findings were damning: To be sure, in all but one of the studies, borrowers who owned businesses did use the loan at least in part to expand their business. And in two studies, ownership of businesses increased. But these expansions were modest and rarely translated into increased profits. Most disappointing of all, in none of the studies did the average microloan borrower end up significantly increasing income relative to the control group. It's worth noting that in some cases this was because the borrower offset a boost in income from their business by decreasing their work at a wage-paying job, leaving their overall income unchanged. Still, the main takeaway about the impact of microloans on small businesses, and on poverty more generally, concludes Karlan, is that in study after study, "the results have just not been as dramatic as was originally hoped for by many advocates." How to explain it? Abhijit Banerjee, an economist at MIT and another author of prominent studies of microfinance, says in theory these findings suggest that extremely poor people served by microloans are somehow inherently bad at business. But he notes that other studies have found that poor people can substantially boost their income if they're given a cash grant or a free asset — for example, some livestock — to use in a business. So Banerjee argues a better explanation could be that microloans have features that make them less suited to launching people into small business. Studies suggest one of these features is the stringent repayment structure of most microloans. You have to start paying back immediately, and there's often no option to delay even one payment. So it's hard to engage in trial-and-error tweaking of your business plan — the kind of experimentation that could help you come up with the most profitable way to run the business. With a classic microloan, says Banerjee, "You have to keep generating cash flow every week and that makes it really difficult." Simone Schaner, an economist at Dartmouth University who has studied programs aimed at increasing women's participation in the workforce, says another explanation of microlending's limitations is that the whole idea of relying on microenterprise to lift people out of poverty is misguided. "Entrepreneurship is a great avenue for some people in some contexts," she says. "But not everyone is best served by having their own small business." She and other researchers also stress that the scientific studies of microlending have not all been doom and gloom. For one thing, they found no evidence to bear out concerns that microloans could actually be causing widespread reduction of incomes by for instance tempting people to take on levels of debt that end up pushing them further into poverty. And on a positive note, studies have revealed that many people turn to microloans for a range of useful purposes unrelated to starting a small business. They can be a way to pay down higher interest debt, for instance, as well as to finance major purchases such as a new refrigerator or a new roof, and perhaps, most significantly, to smooth over the financial hit when earnings from other sources dip or a family member gets sick. In some instances — though certainly not all — this presumably means borrowers are using the loans in ways that violate the terms. Either way, the point is that microloans are serving all sorts of important needs — just not necessarily the small business need still associated with them in the popular perception. And Karlan says that while, sure, granting a poor person access to credit for these other, more modest purposes isn't likely to pull them out of poverty, it clearly improves their life. "And that's good under the principle that if you expand people's choices then they have more ability to do what's best for themselves," he says. This doesn't mean microloans can't be improved upon. Many analysts argue that because poor people's access to savings and insurance plans are limited, they're effectively being forced to use credit to deal with situations that are better handled by these other types of financial products. In short, concludes Schaner, if microloans haven't proved themselves the poor's salvation, neither should the industry be scorned as useless. "Microfinance is a victim of an unfortunate tendency in development, which is that everybody wants to find a silver bullet to solve poverty," she says. "And the fact is that poverty is this massive, incredibly difficult problem. There is no silver bullet."